Dead Frog Brewing out of Aldergrove BC has launched an all new lineup of beers and wiped out all but one of their old brews. Their new “The Festive Winter Saison” is one of their new seasonal staples available in both six packs and mixed 12 packs. The saison pours a deep amber colour with an off white head. The aroma is composed of fruity, yeasty, malty notes with a peppery finish. The flavour is of yeast, fruits, pilsner and roasted malts, pepper, spices and a very mild chocolate finish. The alcohol content comes in at 5.5% with an IBU of 20. This is not your standard Saison for sure but it is has a very pleasing flavour and finish. It is called a Winter Saison for a reason! Commercial Description: A deep amber saison with a slightly sweet malt profile and hints of fruit & spice to celebrate the season. Franco-Belgian malts provide a rich malt base that is accentuated by a warm finish with a hint of festive spices & sweetness. 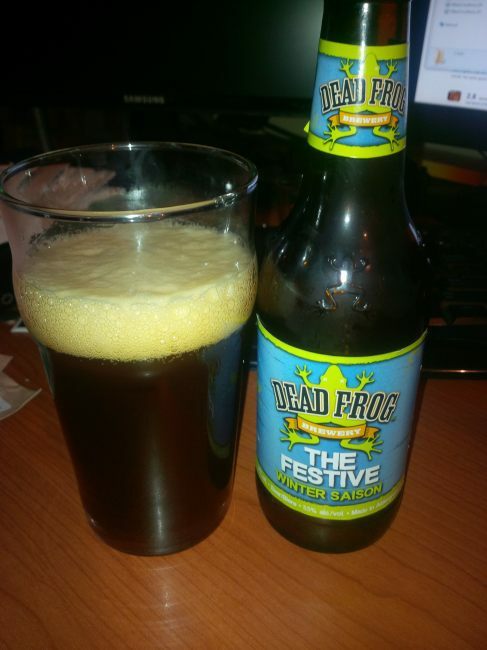 This entry was posted in Saison, Winter Ale and tagged aldergrove, bc, beer, canada, dead frog brewing, festive, mild chocolate, pepper, pilsner malt, roasted malt, roasted malts, saison, spices, winter, winter saison, yeast, yeasty. I have not tried the bottles of this (commitment to a sampler is tough) I did try this on tap at the Hop and Vine Brewmaster’s Dinner. Quite a nice seasonal offering. Wish it came in bombers! I totally agree. I usually don’t commit to anything but a bomber. Good stuff though. Interesting! I’ve been curious to see what their new lineup is like. I’d had a few in the past and was never really that impressed (other than with Valiant), but when I heard they revamped their line and got back to their roots I figured I should give them a second chance. There is good stuff going on now at dead frog. Like all breweries their bombers are the best just like their new Super Fearless IPA but their standard lineup is great also.